To give a background on the above scenario, please refer the following diagram. 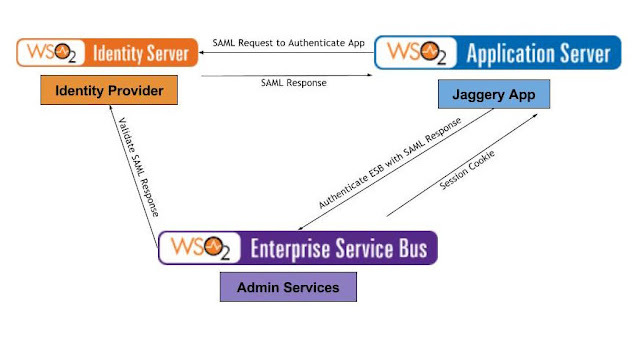 A Jaggery App is deployed on WSO2 Application Server (AS) and we have enabled SAML 2.0 based SSO for the Jaggery app using WSO2 Identity Server (IS) . You can find more details on enabling SSO with IS at . ESB also shares the same IDP. What we are doing here is authenticating the Jaggery App from IDP by sending a SAML request and using the same SAML response to authenticate ESB and get a session cookie. This cookie can then be used to invoke admin services of ESB. [JAGGERY_APP]/jagg/jaggery_acs file acts as the assertion consumer service (ACS). This is the same that is configured in the IDP. Once the request comes to jaggery_acs.jag we will validate the SAML response and get the cookie from ESB. Once we have the SAML response, use the following code to authenticate ESB. var requestPayload = "<xsd:getAPIsForListing xmlns:xsd=\"http://org.apache.axis2/xsd\">"